The RavenHeart Center established in 1997 by Dr. Linda Backman (psychologist in private practice since 1978) reflects Linda's transition from conventional psychotherapy into client psycho-spiritual work. Dr. Backman's passion tied to past-life/between-lives regression and grief/loss has become the pinnacle of her on-going practice. The pathway of the advancing soul, as we step into each new incarnation at birth and exit the body at the death transition, is Dr. Backman’s greatest fascination and the dharma of her present lifetime. Join Dr. Linda Backman, Psychologist and Regression Therapist, and Dr. Earl Backman to know you are a soul having an earthly experience, and your present life is guided-supported on the ‘climb’ to realize who and why you are in life today. The RavenHeart Center Training Institute offers tele-conference and on-site programs for individuals wishing to become a professional Past-Life and/or Between-Lives Soul Regression Therapist, or to simply enhance your soul development. Bringing Your Soul To Light, Dr. Linda Backman's first book, is intended for the individual who recently gained a spiritual perspective of ongoing soul consciousness, as well as to deepen the awareness of the spiritual ripe individual. Raven Social Action. How does change happen in your life? Behavioral steps intended to alter what you believe is not working are essential. Devote your time, energy, and money to take social action steps to create change. YOU are the emissary of change. This in-depth virtual video course is led by Dr. Linda Backman, an expert psychologist and regression therapist who has been in private practice for 40 years. 5-Week Course Cost: Sign up by April 26 for an early discounted fee of $275. After April 26, the fee is $350. Contact Earl@RavenHeartCenter.com or call 303-818-0575 if you have additional questions. For more information on the Q&A discussion, please download the PF flyer below. This in-depth online video course is led by Dr. Linda Backman, an expert psychologist, regression therapist and author who has been in private practice for 40 years. Linda regularly teaches worldwide. Sign up by April 26 for an early discounted fee of $275. After April 26, the fee is $350. Contact Earl@RavenHeartCenter.com or call 303-818-0575 if any questions. During another special FREE learning opportunity with international teacher and expert psychologist, Dr. Linda Backman, we’ll explore how your soul is required to evolve by incarnating both on Earth and Interplanetary. Dr. Linda Backman will share with you what she has learned over the course of 25 years of Soul Regression Hypnotherapy, including past lives on Earth and in Interplanetary settings. This teaching is free - however, you must register to participate. If you cannot attend the event on April 6, you can still listen to the archived recording afterwards. Dr. Linda Backman is an expert psychologist and regression therapist who has been in private practice for 40 years. She is the author of Bringing Your Soul to Light, The Evolving Soul and Souls on Earth. Experience an amazing panel of ancestral healing experts & inspiring teachers sharing a powerful synthesis of spirituality and shamanism, science and psychology, and ancient wisdom from around the world that will transform your life and your lineages. Psychologist and expert regression therapist Dr. Linda Backman comes together with world renowned wayshowers as they bring to light the curative and evolutionary powers of utilizing the guidance from our loved ones throughout our bloodline, and beyond the veil! Ancestral healing ties directly to our blood lineage in life today, as well as our soul lineage. Lifetime to lifetime we reincarnate repetitively with many of the same souls. When we discover our smooth, and not- so-smooth, past life experiences with other souls, we find the common thread that can be unraveled today. Our physical, emotional, and spiritual challenges of today are explained and resolved with the knowledge of past lives. Special GIA TV offer, only $99 for a year! Join Dr. Linda Backman & other international experts for an amazing week of exploration and discovery! "The Truth is Out There"-- a UFO Cruise &Seminar at Sea. October 6-13, 2019--San Diego to Mexico (The Mexican Rivera). Linda will be discussing the findings in her new book, Souls on Earth: Exploring Interplanetary Past Lives, as well as conducting a limited number of 3 1/2 hour Between Lives Soul Regression Sessions. As those of you who joined us previously on the Alaska and Carribean cruises know, this is a wonderful opportunity to hear stimulating presentations, interact with experts in their field, and take advantage of private sessions with a variety of practitioners. A seminar at sea offers a perfect environment to experience and learn in a most relaxing setting. 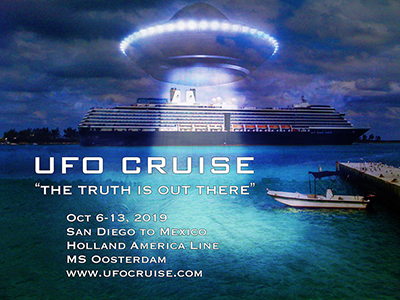 If you are interested, visit www.ufocruise.com for cruise registration information. You can learn about the MS Oosterdam of the Holland America Line, our ship for this exciting adventure. Finally, if you choose to join us, please list Linda Backman as your Referral on the registration form. Interested in a session with Linda on this journey, please write me at earl@ravenheartcenter.com. Join Earl and me, with a small like-minded group of folks, to explore the cultural diversity and wildlife world of South Africa, May 12-25, 2020. We’re powerfully excited to share our first visit to this land with you! I KNOW this is a trip of a LIFETIME. Cain Travel-Boulder & Giltedge Africa will coordinate our amazing journey. The planned itinerary is available here: RavenHeart Group - South Africa Safari. This will be a land package only tour - however, if you would like Cain Travel to assist you with international travel options, they will be pleased to accommodate your needs. We are currently in the final phase of gauging the participation level for this program. If you would like to travel with the group to South Africa, please enter your information in the RavenHeart South Africa - Interest Form as soon as possible, and we will send you more information. If you have more questions about the tour, please write to Earl@RavenHeartCenter.com or call 303- 818-0575. This will be a small group tour, with limited space. We must have all interest forms submitted to us no later than Friday, April 26. During this special FREE learning opportunity with international teacher and expert psychologist, Dr. Linda Backman, you will explore deeply how your Soul Evolution evolves lifetime to lifetime. Join in to expand your insight in life today about relationships, health issues, life choices, and more that tie to your past lives as you gain wisdom. Dr. Linda Backman will share with you what she has learned over the course of 25 years of Soul Regression Hypnotherapy, including past lives on Earth and in Interplanetary settings. This teaching is free - however, you must register to participate. Dr. Linda Backman is an expert psychologist and regression therapist who has been in private practice for 40 years. She is the author of Bringing Your Soul to Light, The Evolving Soul and Souls on Earth. Evolving as a soul is important and is a tricky path at times. One of my favorite ways of working is to sit with you, one-on-one, to shine a stronger light on your soul's journey in this life. Quite honestly, my guides assist continuously, as I talk with you, to know and to offer input about how you can more directly walk your path as you agreed to do in your present body-mind-spirit package. There are many ways to support your advancement as a soul in this life. My goal is to fit together as many pieces of information, both linear and spiritual, to smooth the way for you to move forward. As I combine my psychologist skills with my awareness of soul evolution through our lifetimes and through our 'this life' soul agreement--this is your journey forward to advance as a soul while supporting the organic needs of Humanity to reach Oneness. "BE and DO what you came to BE and DO." I'd love to sit down with you either by phone or face to face to be a mirror to assist your soul's progress. For more information or to set an appointment with Dr. Backman, email Earl@RavenHeartCenter.com. Dr. Backman conducts soul regression sessions in the U.S. and abroad, as well as her home office in Colorado. Astrophysicists are discovering new planets every day. What does this have to do with reincarnation? Join expert psychologist & reincarnation expert Dr. Linda Backman on Coast to Coast AM with George Noory to explore fascinating insights from Linda's new book from Llewllyn Souls on Earth: Exploring Interplanetary Past Lives. Dr. Linda Backman is an expert psychologist and regression therapist who has been in private practice for 40 years. She is the author of Bringing Your Soul to Light, The Evolving Soul and Souls on Earth. RHCTI offers programs both for those who wish to become a professional regression therapist and for anyone who desires to deepen their own spiritual journey and impact the New Humanity. 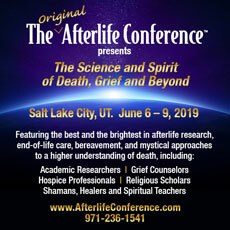 We are proud supporters of the 9th Annual Original Afterlife Conference! Early-bird pricing ends on Feb. 15.